Have you ever had a lesson that just worked! A lesson that truly left its mark. I would like to say this happens all the time, but if I am honest with myself I think those really “special” lessons are just that “special.” Here is the story of one of them. The Inspiration: It started when I attended the session titled “Beyond School Visits” at the 2015 AASL Conference. I did not know it at the time, but this session planted a seed that would later impact my students immensely. The session was made up of six authors sharing how they connect with their readers through schools. These connections were of course through school visits, but also through Skype, messaging, and other forms of social media. One thing the authors mentioned was that they loved to see questions and projects related to their books. They wanted to see that their books were being read and enjoyed. I guess I had never thought about it before, but they were looking for the same validation we all do in our work. They said to tweet at them. So I did! I started including authors in the tweets that were related to a book or project we were working on. Sometimes the author would respond, retweet, or favorite it. I would share this with my students and that made them feel like they had an audience. That was powerful! Then something amazing happened! The Project: Students in second grade were studying the United States. Within this unit of study, they each complete a fairly traditional research project. Students choose a state they want to learn more about and then complete a brochure to convince others to travel there. There are some items students are required to include and other aspects that are flexible. They use print and digital resources to find their information. Collaboration was already happening between the classroom teachers and myself related to the brochures. So when the second graders came to the library for their scheduled library class, I did not want to have them do the same thing, yet, I wanted to incorporate this unit into the library curriculum. I decided to read the book The Scrambled States of America by Laurie Keller. This is a humorous story about when the fifty states decide to switch places. While we were reading, the students were really drawn to what their state was saying. Their state was the state they were researching about in their homeroom classes. So we went with it! Each student took an index card and wrote down three facts from the state they had studied. It could be any three facts they wanted to include or remembered. Then using a blank state map found on http://printablemap.net, students colored their state and drew symbols of the three facts they planned to share. 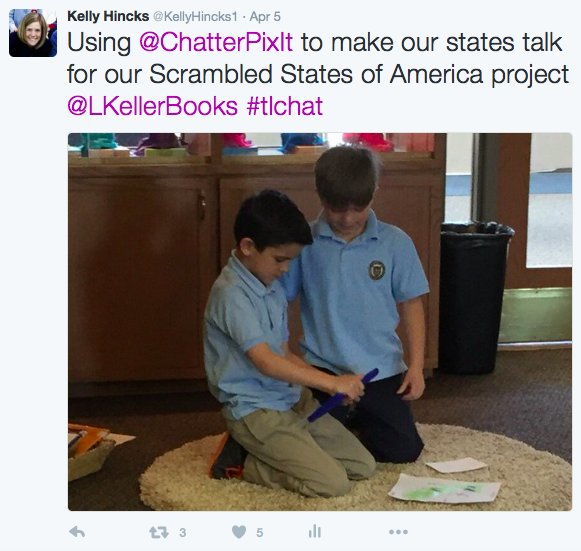 From there students then used an app called ChatterPix to take a picture of their state and record it talking, just like in the book. A final video was created using their maps. Here is an example of a class video: http://bit.ly/28WZF9D. A Whole New Level: So this project was going fine! The students were engaged in the activity, there was some choice involved, they were connecting the library to their classroom curriculum as well as to literature. Additionally, they were incorporating technology to improve their project and thinking about how to represent the facts they had found in a meaningful way for their audience. Not thinking anything of it, I included @LaurieKeller. Well, if you can believe it she responded back and through our conversation a Skype visit was planned. This took the project to a whole new level! Now, the students also had to develop questions to ask her in order to learn more. Question Development: Our next library class, we worked in small groups to develop two to three questions we might want to ask. We discussed what appropriate questions sounded like. Since our project was based on The Scrambled States of America book, we also talked about including questions specifically related to it. After ten minutes working in groups, all fifteen questions were placed on the board (even the silly ones). Then we worked as a group to narrow them down. The conversation that followed was nothing short of amazing! It was well beyond what I ever expected from second graders. They were able to combine, eliminate, and add questions. They gave reasons for why each change should happen. Most of this was done with very little prompting from me. We finally ended up with a list of six questions. The Connection: We had a wonderful visit with the students asking their questions and engaging in conversation. Laurie Keller was awesome as she was able to connect with the students even through it was through a screen. She answered all their questions and then some! She even showed them her view of Lake Michigan. She expressed how much she liked their video. For my students, in that moment, their work had so much meaning and purpose. It truly came full circle. 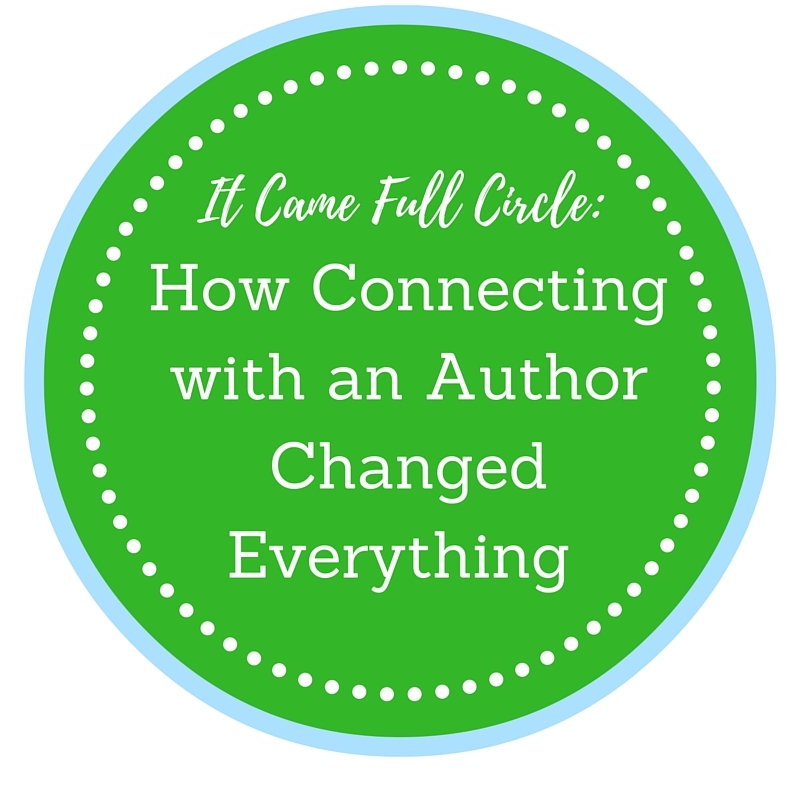 What stated with a read-aloud, lead to a tweet, and created a project with a lasting impact. The biggest take-away was not that they knew three facts about the states that they were studying, but instead that their work could connect them to others. I plan to continue to make connections on behalf of my students. Who knows what might happen next! To learn more about Laurie Keller visit: http://www.lauriekeller.com.